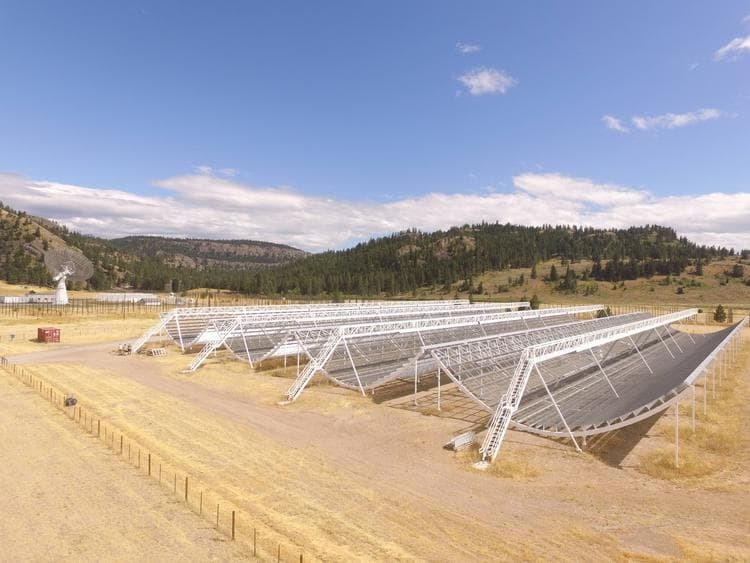 The Canadian Hydrogen Intensity Mapping Experiment is a revolutionary new Canadian radio telescope designed to answer major questions in astrophysics & cosmology. The CHIME Telescope is located at the Dominion Radio Astrophysical Observatory (DRAO), a national facility for astronomy operated by the National Research Council of Canada. DRAO provides a scientific and technical infrastructure that includes engineering development laboratories, fabrication shops, a computer network, internet access, office space, and electrical power. The DRAO site is protected against man-made radio-frequency interference by municipal, provincial and federal regulation. CHIME is a novel radio telescope that has no moving parts. Originally conceived to map the most abundant element in the universe - hydrogen - over a good fraction of the observable universe, this unusual telescope is optimized to have a high "mapping speed”, which requires a large instantaneous field of view (~200 square degrees) and broad frequency coverage (400-800 MHz). 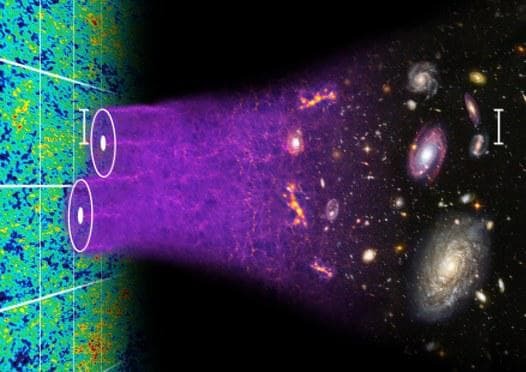 The digitized signals collected by CHIME will be processed to form a 3-dimensional map of hydrogen density, which will be used to measure the expansion history of the universe. At the same time, these signals can be combed for fast, transient radio emission, making CHIME a unique telescope for discovering new “Fast Radio Bursts” and for monitoring many pulsars on a daily basis. CHIME consists of four adjacent 20m x 100m cylindrical reflectors oriented north-south. The focal axis of each cylinder is lined with 256 dual-polarization antennas, each of which receives radiation from a large swath of sky that nearly stretches from the northern horizon to the southern horizon. This gives CHIME its enormous field of view. The CHIME antennas are custom-designed to have good sensitivity from 400 to 800 MHz, in both linear polarizations. This gives CHIME its large frequency coverage. Signals from the antennas are amplified in two stages, using low-noise amplifiers developed by the cell-phone industry. This novel application of consumer technology makes CHIME affordable. The 2048 signals from these inputs (256 antennas x 2 polarizations x 4 cylinders) are fed to the F-Engine for the initial stage of digital processing. The FPGA-based F-Engine is housed in two specially shielded 20-foot shipping containers located between the cylinders. The system digitizes each analog signal input 800 million times per second and converts each microsecond of data (2048 samples) into a 1024-element frequency spectrum between 400 and 800 MHz, with a frequency resolution of 0.39 MHz. It then organizes the data by frequency bin and sends it over optical fibre to the X-Engine for spatial correlation. The input data rate processed by the F-Engine is 13 terabits/sec! The GPU-based X-Engine is housed in two specially-shielded 40-foot shipping containers located just east of the cylinders. Each container contains 128 compute nodes housed in 15 refrigerator-sized racks. Each node is responsible for processing 4 of the 1024 frequency bins by collecting its share of digitized signals from the F-Engine and forming the product of each telescope input with all other inputs, every millisecond. These “correlation matrices” are averaged over a few seconds of time and written to disk for later processing into sky maps. The total system requires 250 kilowatts of power to operate. To search for FRBs, CHIME will continuously scan 1024 separate points or “beams” on the sky 24/7. Each beam is sampled at 16,000 different frequencies and at a rate of 1000 times per second, corresponding to 130 billion bits of data per second to be sifted through in real time. The data are packaged in the X-engine and shipped via a high-speed network to the FRB backend search engine, which is housed in its own 40-foot shipping container under the CHIME telescope. The FRB search backend will consist of 128 compute nodes with over 2500 CPU cores and 32,000 GB of RAM. Each compute node will search eight individual beams for FRBs. Candidate FRBs are then passed to a second stage of processing which combines information from all 1024 beams to determine the location, distance and characteristics of the burst. Once an FRB event has been detected, an automatic alert will be sent, within seconds of the arrival of the burst, to the CHIME team and to the wider astrophysical community allowing for rapid follow up of the burst. CHIME has the sensitivity to monitor practically all known pulsars in the Northern sky. The pulsar monitoring instrument will receive ten sky-tracking beams produced by CHIME's X-engine. CHIME will sample each of the ten sky-tracking beams at a resolution of 6.4 billion bits per second. The signals are sent from the X-engine to the pulsar timing monitor via a high-speed network. The timing monitor processes the signals in real time on ten dedicated compute nodes. Each node consists of a high-powered Intel processor that assembles the incoming data before passing it to an NVIDIA TitanX GPU for timing analysis. The results from the timing analysis are stored on a local multi-disk server before being shipped to Compute Canada. The data output from the pulsar timing monitor is approximately 500,000 gigabytes per year. The high-cadence of these observations will allow us to investigate the properties of neutron stars and ionized gas in the interstellar medium as well as verify the predictions of general relativity and search for gravitational waves. Baryon acoustic oscillations are imprinted on the matter distribution in the early Universe and their effects can still be seen in galaxy surveys. Image credit: Chris Blake and Sam Moorfield. Since the time of Edwin Hubble, it has been known the Universe is expanding. More recently, observations have shown that this expansion is accelerating. The reason for this acceleration is unknown but it has been suggested that a "Dark Energy" is causing the expansion rate to increase. The origin and physics of this Dark Energy are presently unknown. One way to probe the nature of Dark Energy is through studying in detail the expansion itself. CHIME will map the history of the expansion rate of the Universe by observing hydrogen gas in distant galaxies that were very strongly affected by Dark Energy. The experiment will measure the relic of Baryon Acoustic Oscillations (BAO), spherical shells of matter over-density in which galaxies and gas are more likely to be found today. The radius of these shells was established by conditions in the early Universe (up to ~400,000 years after the Big Bang), and in principle is still detectable in the distant distribution of hydrogen gas. What this means is that, for the past 13 billion years, this characteristic distance scale evolved solely due to the expansion of the Universe, and hence provides a standard ruler to measure the expansion rate. The BAO scale has been measured before using galaxy	surveys to map the distribution of matter. This is a long and difficult process that requires resolving each individual galaxy and has a limited redshift range. CHIME will map the distribution of matter using the 21 cm radio emission of intergalactic hydrogen at a resolution much lower than that of individual galaxies, but high enough to measure the BAO scale. This technique, known as Hydrogen Intensity (HI) Mapping, is much faster and will allow for a much larger survey volume than has ever been observed. It avoids reliance on the complicated physics of galaxy formation since galaxies are not resolved and counted, and is well suited to measuring structure on large physical scales. Fast Radio Bursts are brief (few millisecond) bursts of radio waves coming from far beyond our Milky Way galaxy. The phenomenon was first reported in 2007 and as of mid-2017, roughly two dozen have been reported. Their origin is unknown. However, they are ubiquitous: current best estimates suggest these events are arriving at Earth roughly a thousand times per day over the entire sky. Of the known detected FRBs, one, FRB 121102, has been observed to repeat and has been shown to come from a small dwarf galaxy at redshift 0.2. Whether all FRBs repeat and/or are in dwarf galaxies is yet unknown. The CHIME telescope's large collecting area, wide bandwidth and enormous field-of-view make it a superb detector of FRBs. The CHIME FRB event rate is predicted to be between 2 and 50 FRBs per day (Chawla et al. 2017). So high an event rate promises major progress on this puzzling new astrophysical phenomenon. Bright CHIME-discovered FRBs will be found in real time and reported immediately to the worldwide astrophysical community for multi-wavelength follow up. The sensitivity of the world's major Fast Radio Burst experiments. Fast radio burst detection rate on the x-axis and radio frequency on the y-axis. CHIME has a very large expected FRB detection rate, which will be crucial for understanding the nature of this puzzling phenomenon. Radio pulsars are rapidly rotating, highly magnetized neutron stars that can act as exquisitely precise cosmic clocks. Discovered in 1967 by Jocelyn Bell, radio pulsars are like cosmic light houses: they emit beams of radio light from their magnetic poles, which are misaligned with the neutron star rotation axis. Nearly 3000 pulsars are known today. Pulsar timing involves monitoring a pulsar over weeks to years and keeping count of every single pulse emitted. In this way pulsars are very useful for a wide variety of precision astrophysical measurements ranging from unique tests of relativistic theories of gravity using strong-field binary pulsars to the detection of a cosmic background of gravitational waves having periods of many years, predicted to exist due to mergers of supermassive black holes in galaxy-galaxy interactions. The latter is accomplished through a "Pulsar Timing Array" in which radio telescopes worldwide monitor dozens of very rapidly rotating pulsars on a regular basis over many years. The CHIME telescope, with its wide bandwidth and large collecting area, will be excellent for pulsar timing. Its wide field of view and novel software-steered beams will allow scientists to time up to 10 pulsars at any time, 24 hrs per day, 7 days per week. This will enable unique studies of highly variable pulsars such as nullers and mode changers, as well as daily observation of Pulsar Timing Array sources. The relatively low radio frequencies detected by the CHIME telescope will facilitate the removal of the effects of the variable interstellar medium on the radio pulses, one known important source of noise for gravitational wave experiments. This will improve the precision of the experiments carried out by Pulsar Timing Array projects like NANOGrav and the International Pulsar Timing Array, in which several CHIME/Pulsar team members are heavily involved. The CHIME project is co-led by the University of British Columbia, McGill University, University of Toronto, and the Dominion Radio Astrophysical Observatory with collaborating institutions across North America. The CHIME telescope was built with principal funding from the Canadian Foundation for Innovation with partnership from the Provinces of British Columbia, Ontario, and Quebec. The CHIME project also receives funding from NSERC and CIFAR. The CHIME team acknowledges significant contributions from the following companies: AMD, Cisco, Rogers, and Xilinx.